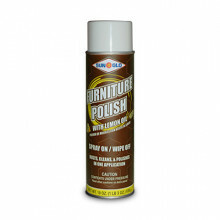 Click the button below to add the FURNITURE POLISH - Lemon Oil to your wish list. This natural lemon oil formulation cleans, polishes and protects fine furniture, woodwork, vinyl, plastic, Formica, leather and metal. It easily, fills in minor scratches and cracks and rubs out quickly to a clear, bright, hard shine. Blended with silicones, this product leaves a non-greasy invisible protective finish that resists fingerprints, smudges and further soiling. Fresh lemon fragrance.